The BLM issued a permit based on an Environmental Assessment, a less stringent process than an Environmental Impact Statement. Exploratory drilling would have included road construction, thus opening the isolated area to traffic and vandalism. Already, the areas that are open to public access have graffitti and bullet holes in the petroglyphs. Due to opposition from tribes and other groups, the BLM stipulated that there should be a fence around the rock art areas and a security guard. However, tribal representatives maintain that the only way to protect Weatherman Draw is to keep it off limits. The National Trust for Historic Preservation, the Sierra Club and 10 tribes appealed the BLM’s decision to approve the exploratory well to the Interior Board of Land Appeals within the Department of Interior. The Trust entered into negotiations with Anschutz and the Department of the Interior, which resulted in an April 23, 2002 agreement whereby Anschutz agrees to turn over its leases to the Trust. The Trust will simply hold the leases until they expire. Thus the appeal has been withdrawn and the Bureau of Land Management will “use its discretion” to not issue further leases until a new resource management plan is released in 2004. “Today’s announcement of an agreement proves victorious for the Crow Tribe and other Tribes who have long held the Weatherman Draw area as a significant religious and cultural site,” says Clifford Birdin Ground, Sr., Chairman of the Crow Tribe. The unusual agreement between a nonprofit conservation group, a corporation and the government reveals the huge impact of media attention on a sacred site conflict. Weatherman Draw was featured in national newspapers and Time magazine as a case study in the Bush administration’s ties to the oil industry. This, along with a coordinated effort between several tribes and nonprofits, resulted in a large-scale victory. However, the long-term future of Weatherman Draw is still not secure. As with other sacred sites, Weatherman Draw has been determined to be eligible for inclusion on the National Register of Historic Places, but the BLM has failed to fulfill its statutory duties under the NHPA by not managing or maintaining Weatherman Draw in a way that considers the preservation of all of its historic and cultural values. BLM also failed to consider the effect of the project on the traditional religious and cultural values of native communities. In the long term, the BLM needs to re-examine the resource management plan for the entire area, specifically barring all types of drilling and not issuing any new leases. In 2001, HR 2085, “The Valley of Chiefs Native American Sacred Site Preservation Act of 2001,” was introduced, but it never left committee. News coverage of the Weatherman Draw agreement: the National Trust for Historic Preservation (April 23, 2003) press release, and reports by the Associated Press, the Los Angeles Times and Indian Country Today. 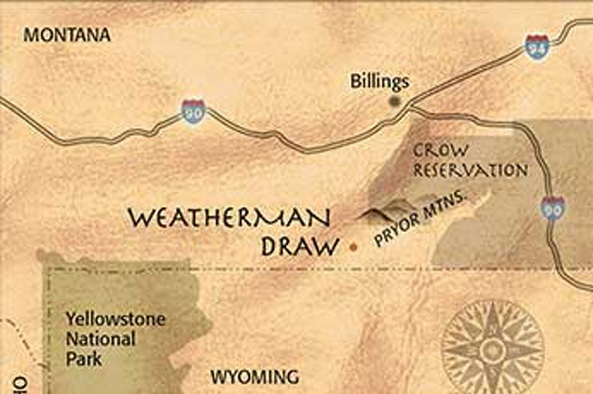 Weatherman Draw and sacred land issues were the focus of the 2nd Annual Native American Issues Conference at Montana State University-Bozeman in March 2002; an Indian CountryToday article gives an account of the issue and the response of tribal leaders. Read the Time Magazine article: “Crossing the Divide: An oil company confronts the ghosts of sacred tribal land” July 8, 2001. Explore a world of sacred lands and discover more than 100 site reports using our interactive map.